Uniservice Facility Management company based out of Whitefield led by WR Volunteer Murugaraj Swaminathan and team is forming a group of technicians consisting of electricians/plumbers/cleaners/pest control services who are specifically targeting the rehabilitation work in kerala. They are currently in touch with the concerned people on the ground and plan to start working around Thirissur till Aluva. 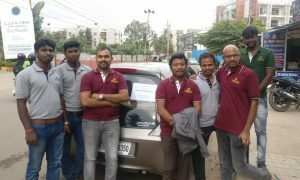 The first team from Uniservice is leaving this evening while others are planning to reach Thirissur by Wednesday. They are in immediate need of the following material (please check the image) Their mission is to electrify 500 houses in Aluva, one of the worst affected areas in Kerala. Those who wish to contribute, please drop off the material at the Uniservice office by 6 p.m. tomorrow (Tuesday) The team is planning to carry as much material as possible with them in a van. Please watch this space for further updates and share within your network. Do help Murugaraj and team to connect with other teams who will be working on rehabilitation and similar tasks in the area.